Centenary Methodist was established in 1839 and named in honor of the centennial of the beginning of Methodism in London, England. Prior to its establishment, New Albany's Methodists had worshipped at Wesley Chapel Church, at the corner of Market and Lower First streets. The original Centenary building - completed in 1841 - was a "simple rectangular structure of two stories, and was quite an advance in the architecture of the times, being by far the best public edifice in the city. The lower story was eight feet high, and was divided into Sunday School rooms and lecture hall, with the speaker's stand on the west side. The upper story, with a gallery across the south side, was reached by wooden stairways on the outside of the building, unprotected from rain, snow, sleet or sun." The building has seen numerous modifications through the years, including the loss of the steeple following a lightning strike in 1900. 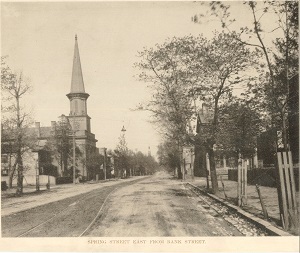 The photo below shows the church with steeple intact around 1892. New windows were also added at that time, as the originals were destroyed by hail in the same storm. The former parsonage to the west of the church was constructed in 1935, replacing an earlier structure. A fantastic opportunity in Downtown New Albany. Maybe you're not looking for a church home, but what about living space? Something cool, hip and funky with a millennial vibe. We also need more senior housing with some independent living. You could mix it up with co-existence of space that caters to all walks of life. This property offers lots of creative uses. What about a boutique hotel? Great character throughout the main sanctuary. Lots of useable space, huge kitchen, fellowship space, plenty of parking of right in the middle of a rapidly growing Downtown with lots of hustle and bustle. The church reserves the right to remove certain items to include the organ and all furnishings. Discussion as to what might stay is separate from the sale price. The sanctuary offers an impressive view, lead glass windows, really high ceilings, open space, class rooms, fellowship hall, kitchen and more. Property is included in the UEZ (Urban Enterprise Zone), a TIF (Tax Increment Financing) district, and the Downtown Historic District. Any exterior alterations are subject to review and approval by the city's Historic Preservation Commission; for more information and a copy of the design guidelines for work in the historic district, visit www.newalbanypreservation.com. 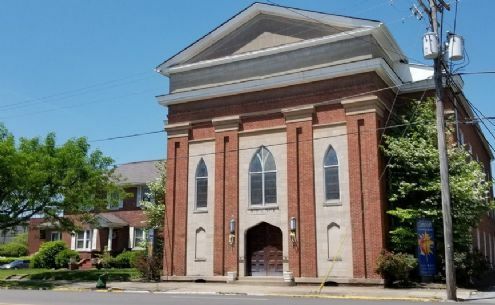 Because the Downtown Historic District is also listed in the National Register of Historic Places, the new owner would potentially be able to take advantage of grants or tax credits to help recoup a portion of rehab costs, depending on the end use. Contact: For more information contact Mike Kopp, REMAX First Commercial Group, at 502/386-9022 or mike@callmikekopp.com.